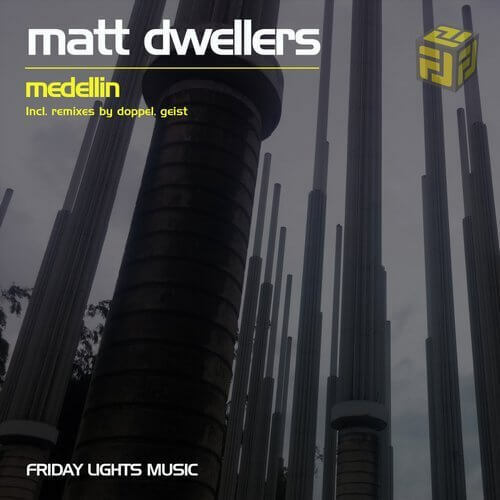 Friday Lights Music is thrilled to host Matt Dwellers (a French-man based in Australia) with his deep and glowing EP ”Medellin”. Matt is a real phenomenon of 2017, he is releasing lots of high-quality music, playing few times every weekend across the southern land, remixing and jumping from project to project, one could almost think he has 48 hours a day! ”Medellin” is no exception – is a really strong, deep and groovy EP that can work on many different dancefloors, from a hipstery bar to a desert rave. Australian DOPPEL is another rising super-star with his shining remix. Geist from Sweden adds that necessary deep weirdness with his remix. Matt closes the EP with Convertible Futures – positive and melodic piece. Medellin (Original Mix) is a glowing track with low bpm and a lot of attitudes. Wonderful melodic abilities of Matt can be heard clearly through a really cool bassline part and different synths parts. The groove here is very tight and all over the place at the same time – Perhaps that’s how Matt feels the underground city of Colombia. Medellin (Doppel Remix) is a faster-paced version of the original. Doppel is a highly respected artist in the Aussie land and beyond it – his work was released on legendary ”Open Records” and supported by producers like ”Sebastian Leger”. The sound is so clear and it feels like Doppel taking us to a new level of high-tech progressive. A real bomb but with a tender touch! Medellin (Geist’s Stranger Things Remix) is weird in the best way possible. Glen C aka Geist is based in Sweden and creates a lot of groovy low bpm progressive vibe music. In this track, he got inspired to get even deeper and weirder – kinda ”screw the rules” attitude. We really like it! If you want to surprise your audience and still make them move to the beat – this is your remix! Convertible Future (Original Mix) is another chance of Matt to show us how groove and melodic atmosphere can take you totally away for 7 minutes…perfect way to finish an EP.